It’s Spring. Let it rain…Free Passes! The natural water levels on the Lehigh River are generally at their highest in the spring. 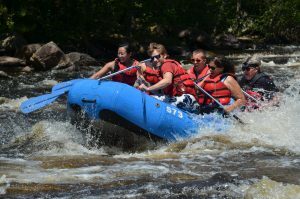 We invite you to join us for a whitewater rafting adventure. As an added bonus, if you come whitewater rafting with us any day in April or May, every person in your group will receive a free pass to come back and play paintball at Skirmish – that’s a $36.00 value. It’s been a long winter – Get Outside Today!